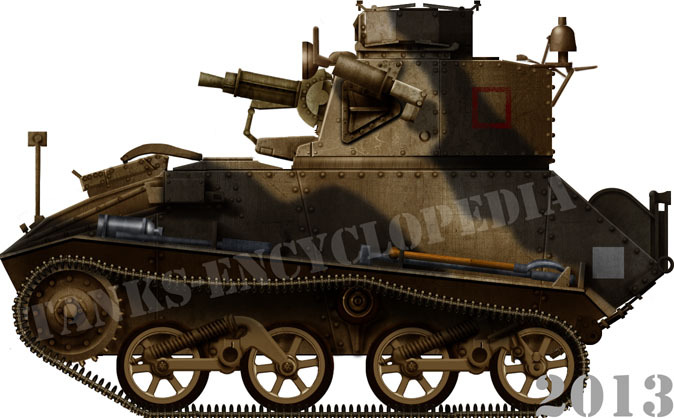 The Vickers Light Tank Mk.VI was elaborated by Vickers, alongside its best export seller, the Carden-Loyd Mk.VI tankette. 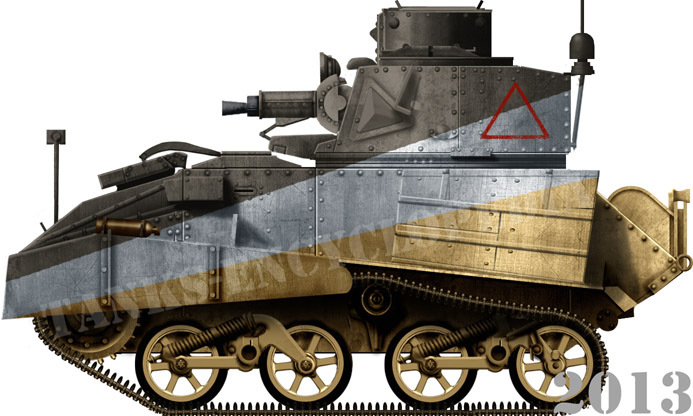 Vickers produced light scout tanks in limited numbers for the needs of the Royal Army. These started with the Mk.I (1929), the Mk.II and III (1931-34). Then came the Mk.IV, largely inspired by the former (1934) and followed by the next Mk.V, which marked a real step forward with a three-man crew and the larger hull required to operate an improved armament, the Vickers cal.50 (12.7 mm) heavy machine gun. 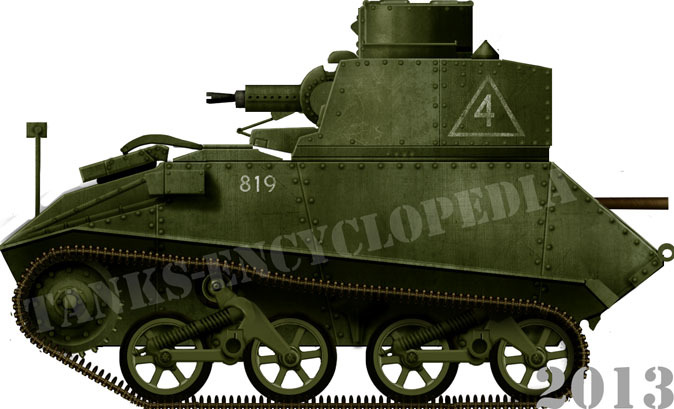 The Mk.VI was logically based on this model, with a higher degree of standardization, which allowed moderately low prices. 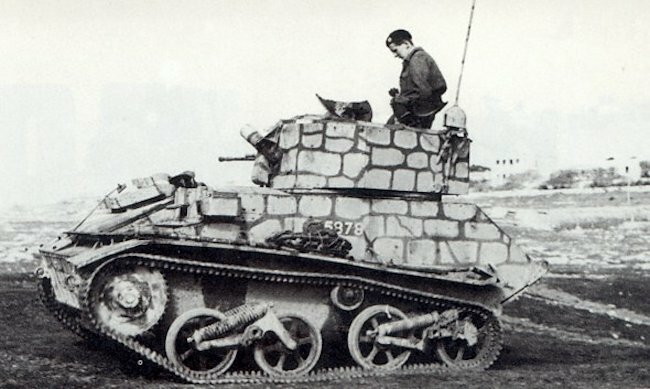 Although sharing most of its components (hull, tracks, drivetrain, suspensions, fittings, armor and armament) with the Mk.V, the Mk.VI, designed in 1935, received a roomier turret, extended at the rear, and able to house a No.7 wireless radio set, which gave new tactical perspectives. The weight, due to the turret, rose to 4900 kg (10,802 lbs), which in return required a better engine. This was an 88 hp Meadows air-cooled six-cylinder gasoline engine mounted on the right side of the hull, served by a new transmission (5 forward, 1 reverse, Wilson pre-selector gearbox), with a redesigned engine clutch, which would prove troublesome. As in previous models, the drive sprockets were at the front. The overall speed was even better than previous models, a precious asset in future desert warfare engagements. The old Horstmann coil-spring suspension system was kept unchanged, as it was found reliable and easy to maintain, although the pitch was quite violent during rough drives, rendering any aiming of the gun useless. However, the engineers managed to move the center of gravity forward, allowing a smoother ride. The crew of three was somehow lodged in the cramped interior, the driver sitting on the front left while the commander (also radio operator) and gunner stood on a platform that revolved with the turret. Above it towered a smoothly shaped cupola. The main armament was kept unchanged. 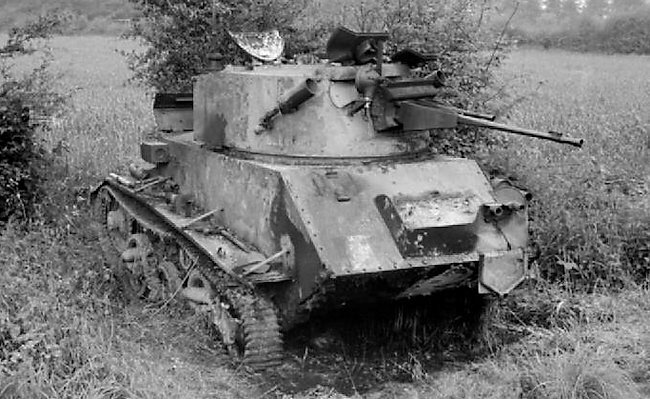 The heavy cal.50 (12.7 mm) Vickers had some armor piercing capabilities against armored cars and other light tanks, mostly protected by up to 16 mm (0.63 in) of armor at the time. The Mk.VI’s protection was unchanged, still capable of stopping small shrapnel fragments, rifle-caliber machine-gun, rifle and small arms fire. When the first prototype passed all trials in 1936, the Imperial General Staff considered this model superior to any other in service worldwide. Vickers Light Tank Mk.VIa of the 3rd King’s Own Hussars. Soon after production began, it appeared that the initial series had some flaws to fix. The return roller, initially over the top of the leading bogie, as in the Mark V, was displaced to the back and attached to the hull sides instead, while the cupola was a new hexagonal model, and the turret octagonal. Ground pressure was lowered from 7.54 psi (0.53 kg/cm2) to 6.9 psi (0.49 kg/cm2). The armament was unchanged, the main Vickers heavy machine-gun being supplied with 400 rounds, and the secondary machine-gun by 2500. The engine was now the improved Meadows ESTB. This model was nearly identical to the former, but with some production simplifications, like the one-piece armored louver over the radiator (instead of two-piece), and the return back to the circular commander cupola model, but with a plainer shape. The turret was fitted with a mounting for a Bren AA gun. The radio set was upgraded to the N.9, and the weight rose to 5 tons. At the end of production in 1939, a new, more compact BESA heavy machine gun (15 mm/0.59 in) was installed, and the coaxial one was upgraded to the new Besa 7.92 mm (0.31 in). Armor thickness was also increased to 15 mm (0.59 in), and 16 mm (0.63 in) on the hull front. The Meadows ESTB/A or ESTB/B engine developed 88 bhp at 2800 rpm, which gave a 16.9 hp/ton power-to-weight ratio and a 200 km range (125 mi). The steering was done through clutches and annular spur reduction on the final drive. This was the overall most produced version. A sub-variant, called the “India pattern” (as most were sent to serve with the British Indian Army) had a single periscope mounted in the turret hatch for the commander instead of the usual cupola. This wartime variant was also the last production version of the entire series. The most obvious change was the removal of the commander cupola, replaced by two domed hatches with a commander periscope. It also had wider bogie wheels and tracks and three carburetors for the engine, slightly improving its performances. The cover now had one inlet louver. Top speed was still 35 mph (56 km/h) and 25 mph (40 km/h) cross-country. The standard armament consisted of two Besa machine-guns, one 15 mm and one 7.92 mm coaxial. On many vehicles, a bullet deflector plate was also added to the driver’s vision block. The Besa heavy machine gun, produced at Birmingham Small Arms Limited (BSA), was essentially a scaled-up version of the common 7.92 mm (0.31 in) model, originating in a Czech design (ZB60). Its long barrel gave an excellent muzzle velocity. It could be fired on repetition (single shot) at a rate of 450 rpm, and employed an unusual method of cocking. It was not overall successful, nor did it have the punch of a 20 mm (0.79 in) caliber and, subsequently, production was limited. It was declared obsolete in 1944. This model was first intended for reconnaissance and colonial warfare, and many were sent abroad, to India, Africa, and Palestine. 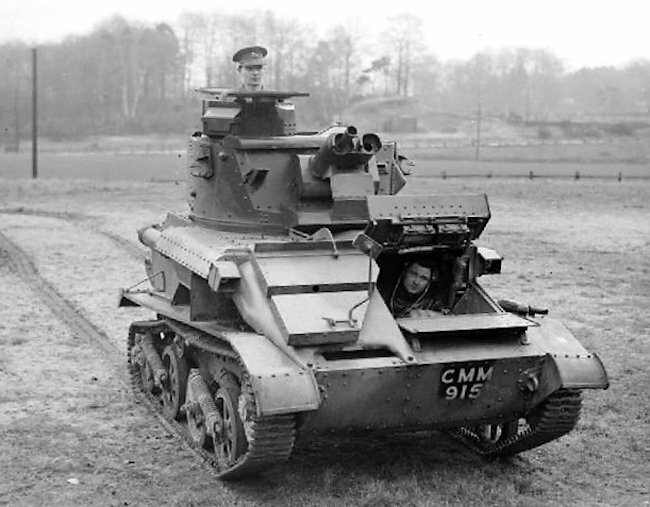 The cheap Mk.VI was by far one of the most numerous tanks in the British Army when the war started, with approximately 1000 in service, compared to only 79 Cruisers I/II and 67 Infantry Tank Mk.Is. It was still largely available during the French campaign. For the 1st Armored Division, 108 of its 321 tanks were Mark VIs. Inside of the BEF there were 550 Mk.VIA and 200 Mk.VIB Vickers Light Tanks. 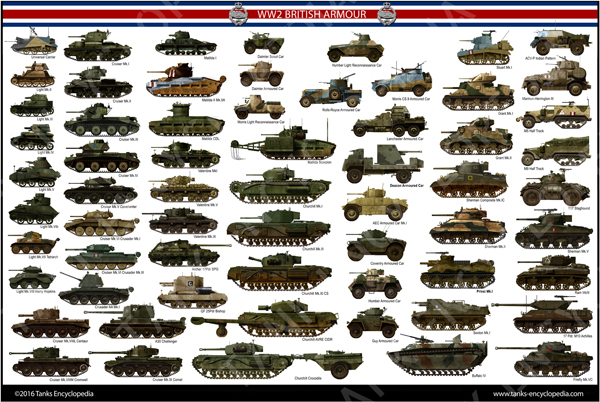 Each divisional cavalry regiment was equipped with 28 Mk.VIs. Wartime operations proved disastrous against equally fast and far better armed tanks like the Panzer II and Panzer 38(t) and, of around 400, only 6 made it out of France. This left mainland territory devoid of any sort of armor when the battle of Britain began. 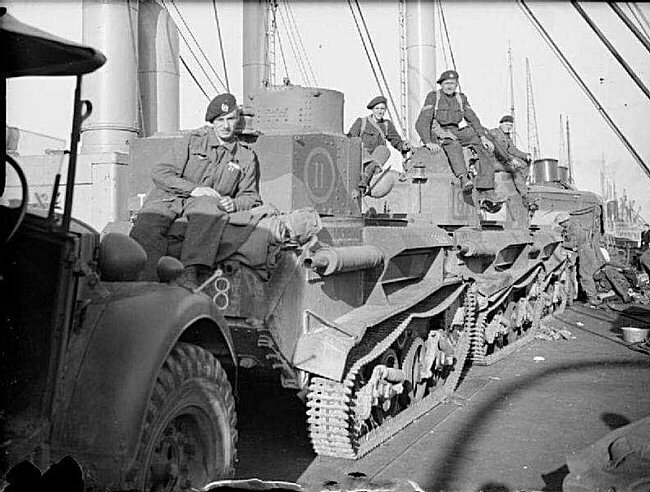 However, they showed better qualities and were found up to the task in North Africa, when the counter-offensive began against the failed Italian invasion (Operation Compass), where 200 Mk.VIs (chiefly with the 3rd Hussars and the 7th Armoured Division) formed the backbone of the British armor, together with 75 Cruisers and 45 Matildas. Despite their feeble protection and machine-gun armament, they performed well against lightly armored Italian vehicles and tankettes, being particularly suitable for fast outflanking maneuvers against the retreating Italians, capturing many prisoners. The British lost many tanks, but the 2nd RTR was probably the most successful during these kind of operations, retaining most of its forces until February 1941. Mark VI tanks in active service gradually degraded with the arrival of the Afrika Korps. They soldiered on until early 1942, many being sent to Greece, where they formed the bulk of the 4th Hussars and other units, and again in Crete (3rd The King’s Own Hussars), and Malta. Others served in Iran, with the Anglo-Soviet Invasion of August-September 1941, or were part of the landing force which fought in Syria against Vichy France. A handful of Mk.VIs were sent in 1939 to Australia and manned by Australian crews. 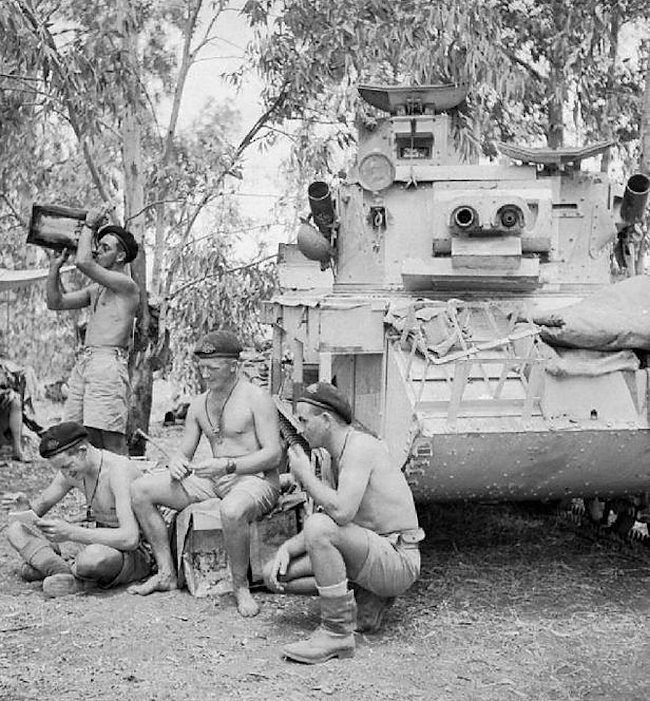 The South Africans and the Canadians also received some light tanks, and the former successfully operated these in Abyssinia throughout 1941. During the siege of Tobruk, the 1st Royal Tank Regiment had only 16 of these but managed to move them on a daily basis, giving the Germans the impression of a much more impressive tank force. 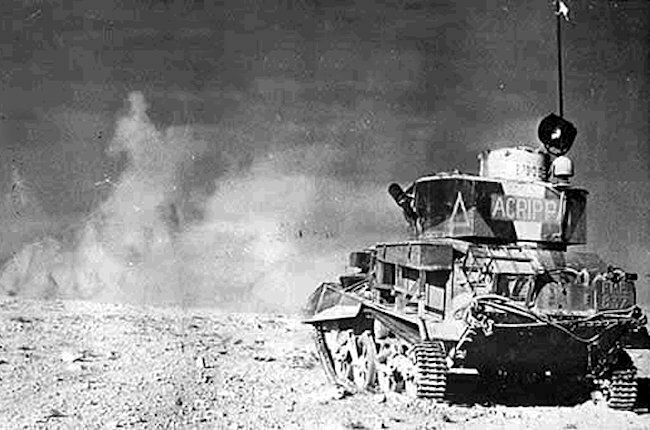 By mid-1942 and prior to the first battle of El Alamein, surviving Mark VIs still in service had been withdrawn and were used as mobile observation posts and local AA defense versions. 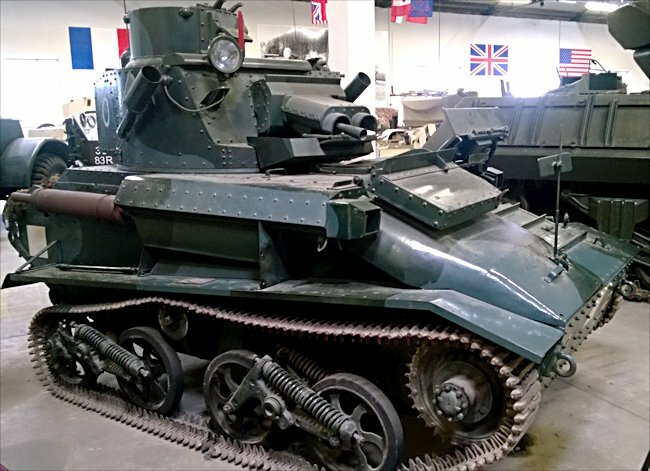 The M3 Stuart had replaced them and was now largely available. Light Tank AA Mark I (late 1940). This model had a new redesigned turret, housing a quad-7.92 mm (0.31 in) Besa or a twin 15 mm (0.59 in) Besa heavy machine-gun AA mount. Because of this new turret, the traverse was now done by hand, which severely limited its speed and the effectiveness of the entire solution. The crew was only two. Production of this model is unknown and ceased by 1941. 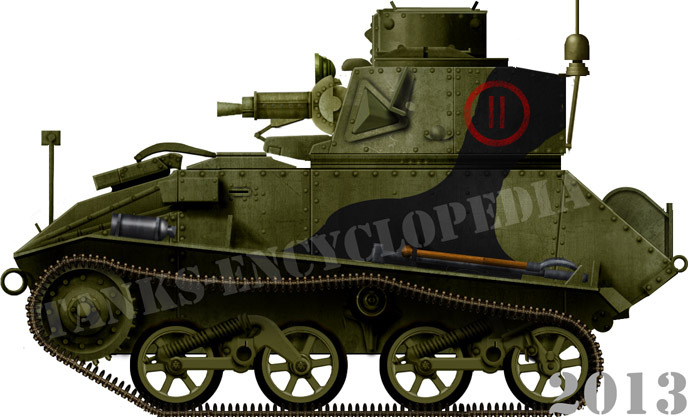 Light Tank AA Mark II (1941). An improved version of the first, now with fully powered traverse, wider and more accessible turret, and better quality sights. This photo is of a 2 pdr /40 mm Vickers gun mount on the Mk.VI light tank chassis. It was an anti-tank self-propelled gun (SPG) not a tank. It had an open topped turret in keeping with later WW2 design ideas for SPGs. It was felt that in a revetment a wide view was essential. Such weapons were primarily defensive in nature. If the finance and the fore-sight had been available in the British War Office this could have been an excellent asset during the invasion of France, Belgium and the Netherlands in May 1940. Unfortunately it did not enter into production. 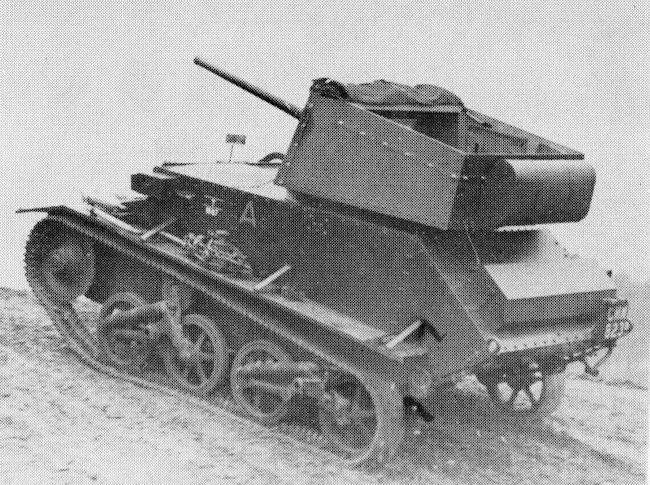 Vickers Mark VI 2pdr SPG prototype. Notice the open roof and folded tarpaulin canvas cover. 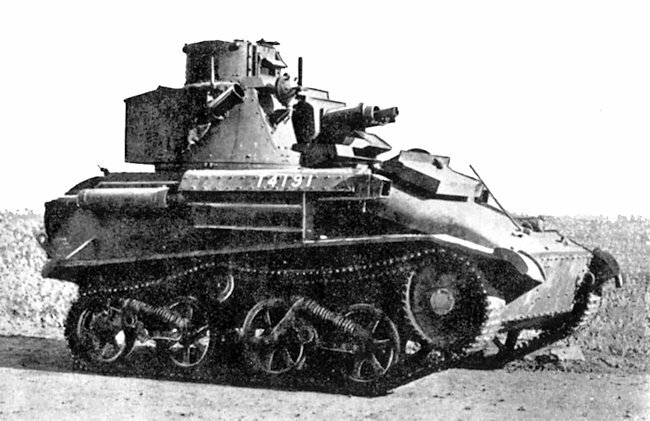 Light Tank Mk.VI, first batch vehicle, early 1937. Only a handful of these were produced, perhaps 30 or 40, and they were likely used, after 1939, as training machines, like the Mk.Vs. 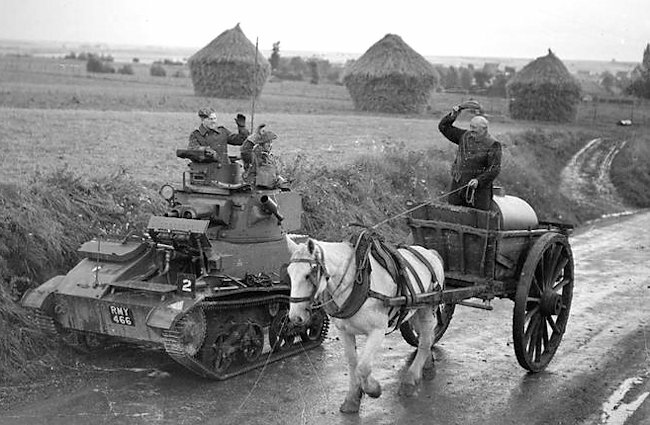 Light Mk.VIa of the British Expeditionary Force (BEF), western Belgium, May 1940. Light Mk.VIb of a C.A.F.V.T (Canadian Armoured Fighting Vehicle Training) unit, late 1940. Light Mk.VIb of the 11th troop, C squadron, 2nd Royal Tank Regiment, France, May 1940. Light Mk.VIb, A Sqdn, 1st Battalion Royal Tank Regiment, 7th Armoured Division, Egypt, fall 1940. Light Mk.VIc, Malta, June 1942. This late version, produced until mid-1940, was reequipped with a high-velocity 15 mm (0.59 in) Besa machine-gun. The Besa heavy machine-gun had a better punch and accuracy than the Vickers cal.50 (12.7 mm). However, it also had poorer performances compared to the German 20 mm (0.79 in) that equipped the Panzer II. Its unusual method of cocking was tricky and needed careful maintenance. 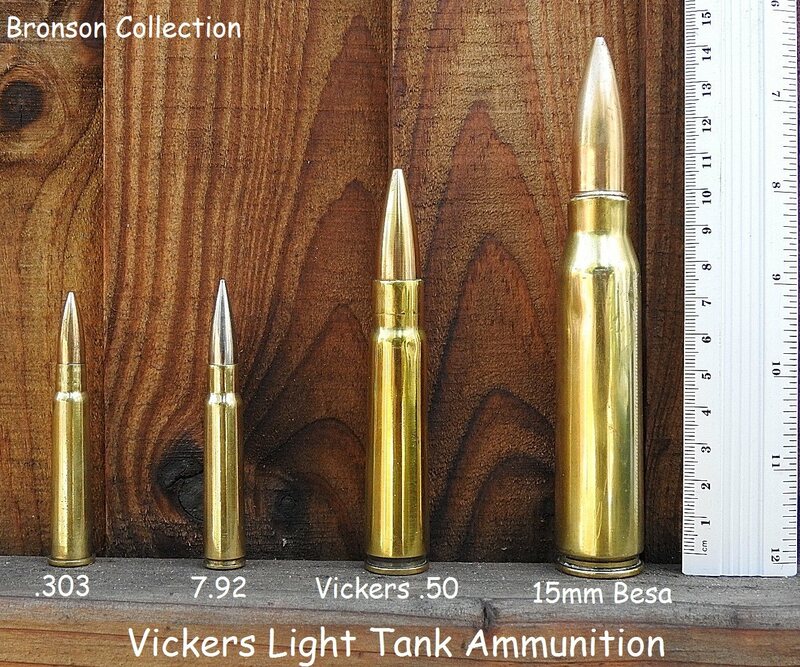 The cartridges used by all of the versions of the Vickers Light Tanks, including the ones used on the Mark VI. Source: Bronson, British Collectors of Arms & Militaria Forum. 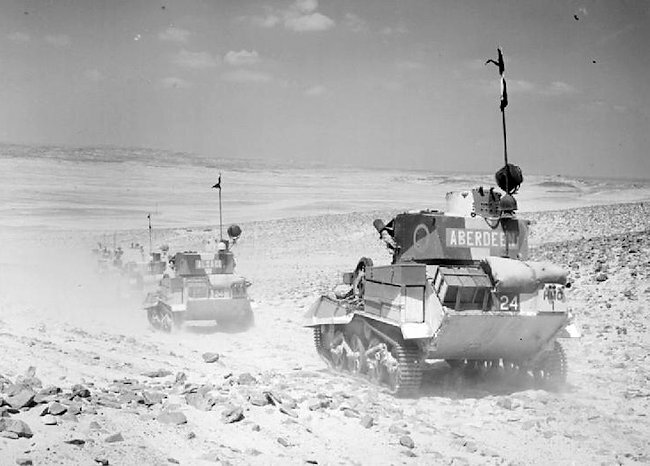 Vickers Mk.VIb Light Tanks of 7th Armoured Division on patrol in the desert, 2 August 1940. 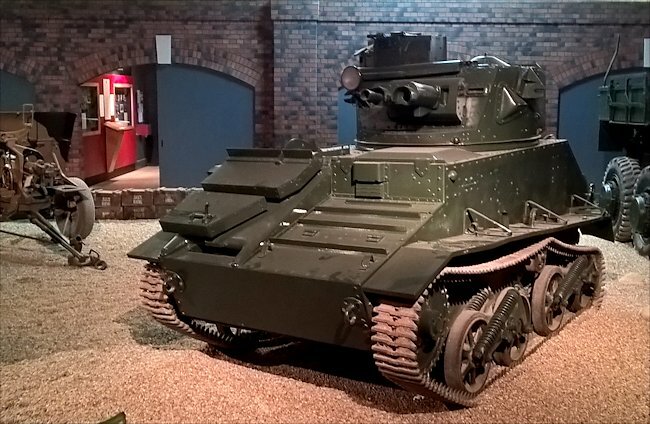 Not all Vickers Light Tank Mk.VI were lost in France before Dunkirk. These Mk.VI tanks belonged to the 5th Battalion, Royal Tank Regiment. They were photographed on the ship MV DELIUS at Southampton having returned from France during the evacuation of British forces from Cherbourg, 19 June 1940. Notice the two tone camouflage. I spotted an error in your article. Australia received their Vickers in August 1937, not in 1939. We shall fix this, thank you. How does 0.53 kg/cm2 compare to 7.54/6.9 psi? It would be helpful to be consistent with units (and perhaps include both Imperial and metric). Good point, however that whole section is a bit dubious and I removed some claims from it. Again (I am sure I am being annoying), you all need to stop referring “light” machine guns. It is not a term for “a gun that is not a heavy machine gun”. An LMG is a man-portable gun capable of bursts of automatic fire, usually fed from boxes, pans or drums. A belt-fed fed gun alone can be called a “heavy” machine gun, especially if it is water-cooled. It doesnt have to be a .50cal to be a ‘heavy’ gun. If you need to distinguish them from heavy-caliber MGs, call them “rifle-caliber machine guns”, or RCMGs. People know what that means. To say ‘its armor was proof against light machine guns’ makes no sense, because a LMG fires the same ammo as a larger “medium” MG. If its proof against LMGs, then its proof against anything that is NOT a heavy MG. Hell, by common usage a water-cooled Vickers is a ‘heavy machine gun’, and that fires the same ammo. Hence ‘RCMG’, since it describes whats important here…the size of the caliber, not how easy it is to carry around the battlefield. You’re not being annoying, we appreciate the time and effort spent in reading and commenting. That is why I continuously answer you and correct the point you are raising, and I thank you for that. G’day. Wondering if you can help me some information. Would like to make a model of one of two MK VIa light tanks sent to Cyprus in May 1941 as part of the Australian 7th Div Cavalry Reg. Do you have any information on camouflage paint scheme and markings. Have been able to work out some markings from Anzac Steel website. Particularly interested in C Squadron tank “Carlton”, number T2424 (I think). Any information would be appreciated. I’ve done a bit of reading and while I don’t have a 100% definite answer I have an idea of the most likely colours of the vehicle. Camouflage schemes varied quite a bit in the middle east/Mediterranean based on what paint was available as well as evolving ideas of how best to apply camouflage. Additionally AFVs issued to the Australian Regiments were drawn from British ordnance depots and were typically leftovers from a mixture of British regiments, hence several camouflage schemes can be seen within a single divisional cavalry regiment (there is a photo of 9th Div Cav Rgt on parade where several camouflage schemes are visible). 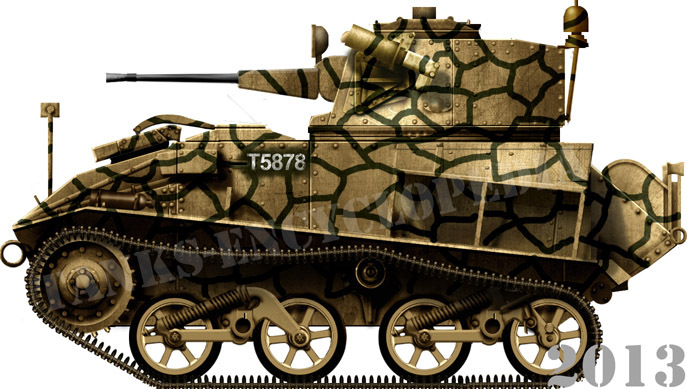 However it seems that the Vickers light tanks were most likely painted in the British 3 colour ‘Caunter’ camouflage scheme. You can see it rather clearly in the photo of 9 Div Cav Rgt below as well as on one of the tanks of 7 Div Cav Rgt. Additionally based on the photo of ‘Carlton’ in Cyprus, while it is hard to say for sure. it does appear that there is a darker patch on the side of the turret of all 3 tanks which would match for the Caunter camouflage. I Also found a photo of 2 of 7 Div Cav Rgt’s tanks, T4255 and T2159 , on a ship (presumably headed to or from Cyprus) where both tanks clearly show the 3 tone stripes of the Caunter camouflage. The Caunter scheme is relatively straight forward although for several years it had been incorrectly represented with a blue colour which is actually a grey.